Yesterday morning, my cousin showed up at my doorstep for a quick visit as she was passing through town. We sat in the living room, drinking coffee and covered all our favorite topics: babies, family, things we miss about our grandmother, her favorite wedding gifts so far (a handmade rug from home "grown", hand-dyed alpaca yarn…wow! ), and of course, most importantly–knitting. But what I couldn't get past, was the knitting she was wearing. How much do I love this necklace she made? 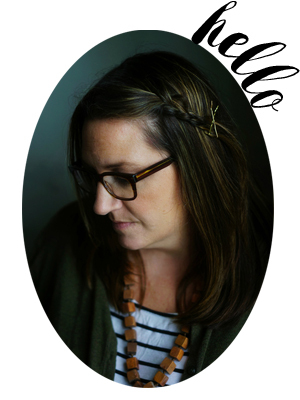 She said she whipped up last January, but that the cord took forever….a long i-cord grafted together, a seed stitch "clasp" to hold it all together. Oh my goodness. It’s glorious. I totally understand why you want one – so do I! Just gorgeous… thanks for the inspiration! this is beautiful!! 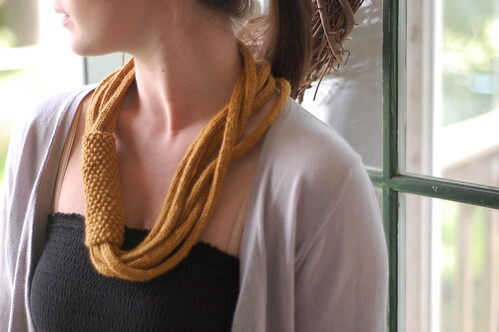 There is a similar patten that made the rounds a few years ago called Seven Circle, I think, that is similar and uses knitted loops (rather than i-cord):http://www.ravelry.com/patterns/library/sevencircle I love the addition of the seed stitch band, though!! now i know what to do with the one little skein gifted me from scotland! thanks for sharing your cousins creation. I made something similar out of an old tshirt, but I like hers so much more. I think a good cousin would make you one! It’s lovely – funny I almost posted the seven circle, too – but saw someone else mention it… haven’t done it yet, but it’s lovely! We really NEED that pattern! Wow, I love it!! so lovely!!! Makes me want to learn to knit! ooh, I sure hope this turns into a pattern! I am dying to make one! wow. that is beautiful. if only I knew how to knit. Molly,Sounds like a great visit. Don’t you love when you just click with someone. Please tell your cousin I would love to purchase one from her! WOW – best textile around the neck I’ve seen in a long time. love it. Wow. 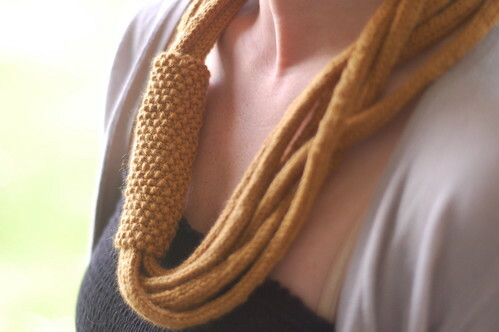 This is the first knitted necklace I have ever wanted to wear. Let her know that I’d purchase the pattern from her if she’d be willing to write it up! That is brilliant, haven’t seen anything like that before. It looks like it could have take quite a while to make.